We Americans love to use energy. Whether it’s a high-powered air conditioner during the hot summer months, a big screen TV, a hevay duty washer and dryer, or multiple computers, we use more energy today than ever before. The problem is, not all homes are equipped for such a large quantity of energy. The electricity you use enters your home through the electrical panel, the box containing circuit breakers or, in an old house, fuses. If your electricity intake exceeds your panel's capacity, you will need to upgrade it. When to Upgrade Or Replace? If you live in a city like Boston, which has many older homes, your home might have the old-fashioned kind of electrical panel which uses fuses. If so, contact an electrician and have the electrical panel replaced with one that uses circuit breakers instead. Because fuses are considered a fire hazard, most insurance companies will not insure such a home. If you’re considering purchasing a home that still has fuses, have the seller convert to circuit breakers before closing the deal so that you can be eligible for homeowners insurance. Alternatively, you may be planning an addition to your home or installing a high-powered air conditioner, hot tub, or any other energy-consuming appliance. If this is the case, your current electrical panel may not provide adequate energy. 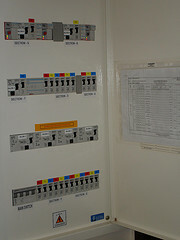 Standard electrical panels can provide 100, 150, 200 or 400 amps of power, and anything less is illegal. If your electrical needs exceed your amp capacity, your circuit breakers will trip whenever you attempt to power the appliance, leaving you without electricity, so be sure to upgrade to a higher amperage. Does a Tripped Breaker Mean I Need a New Electrical Panel? Alternatively, you may have a faulty breaker. To test, unplug all electrical devices. With the breaker off, reconnect a single device and then try to turn on the breaker. Repeat this process with each device. If the circuit trips, you have identified a problematic device -- one which may either have an electrical problem or just require more energy than your electrical panel can provide. If, for example, your air conditioner is continually tripping the circuit, you may want to contact an air conditioning contractor to discuss downsizing or an electrician for rewiring. In many cities it’s illegal for anyone other than a licensed electrician to perform electrical work, and many home insurance policies do not cover damage incurred by a non-licensed electrician. Therefore, this and other electrical work should only be performed by a professional.